Thank you for attending Glow and supporting Groundwork Lawrence! Each year Groundwork Lawrence helps thousands of Lawrence residents, youth, businesses, and community organizations “change places and change lives,” tackling our community’s most intractable challenges. Groundwork’s Glow Gala and Annual Fundraiser supports that work and helps to sustain the “glow” of our impact in the community. Proceeds from this event directly support our environmental and open space programs, youth education and employment initiatives, food access programs and community events. See photos from 2018's event here! Glow Gala 2018 is supported in part by Lead Sponsor, New Balance Foundation. Thank you for your continued support of Groundwork Lawrence! 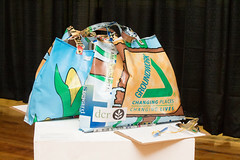 It incorporates at least one of the “4 R’s” (Reduce, Reuse, Recycle, Repair).